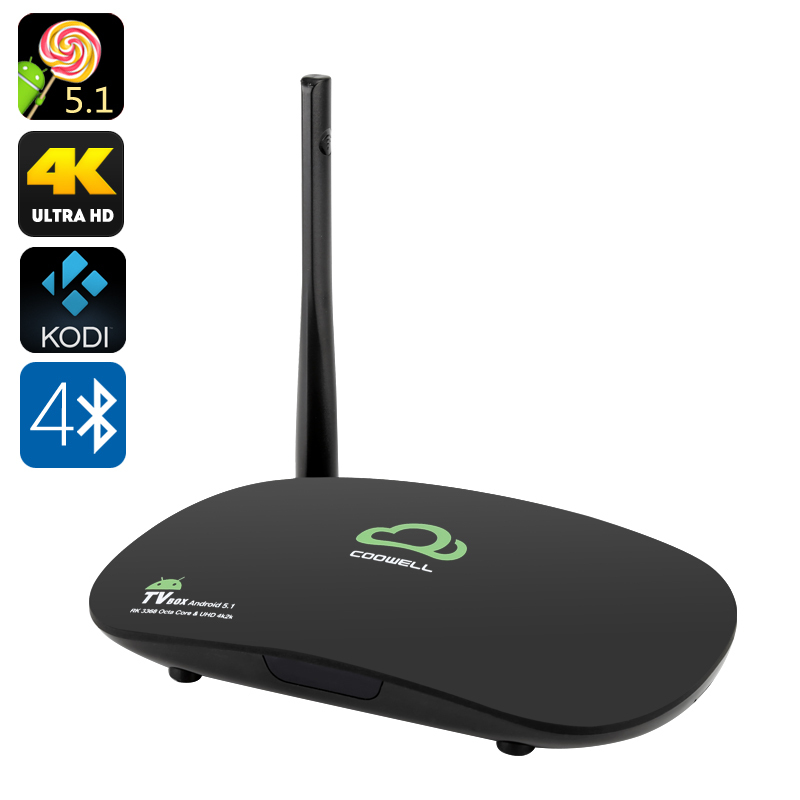 Successfully Added 4K Android 5.1 TV Box - Octa Core RK3368 CPU, 2GB RAM, Kodi, 2.4GHz Wi-Fi, Ultra HD Output, DLNA, Miracast, Airplay to your Shopping Cart. An Android 5.1 operating system makes it easy to navigate and brings a wide range of support as well as access to a plethora of apps via the Google Play store, this will let you install all your favourits such as Netflix, TVCatchup, Hulu and more. Coming with the Kodi media player preinstalled this TV box brings free access to a lifetime of TV dramas, movies and sports. The V3 TV box's large Wi-Fi antenna has excellent connectivity and supports the latest and fastest speeds with its 802.11a/b/g/n support on 2.4GHz bandwidths. This ensures toy get a nice clear singnal for your wirless communications. There is 16GB of storage on this mini TV Box that can easily be upgraded via the micro SD slot so you should never be short on space. With left and right speaker out ports you can easily connect a sound bar, speakers or your amp to the audio output, making this TV box a great control centre for all you media needs. On top of this you can the TV box has Bluetooth 4.0 support for wireless transfer between devices and can take advantage of DLNA, Miracast or Airplay letting you share content direct from your smartphone or tablet PC. This V3 Android TV Box comes with a 12 months warranty, brought to you by the leader in electronic devices as well as wholesale Smart TV Boxes..